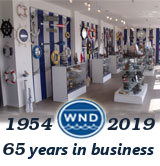 Hampton Collection Chrome with White Leather Binoculars 62"
Floor Standing Admirals Antique Brass Binoculars with Leather 62"
The Hampton Collection Floor Standing Chrome with White Leather Binoculars 62" is truly a nautical decor masterpiece. This is a fully functional double barrel binocular, and is part of our top of the line Hampton Collection. Perfect for those looking to enhance a nautical theme room, our binoculars will look great resting on your living room floor or patio deck. The pictures of this amazing nautical decoration do not do it justice. The polished solid chrome double scope is hand-wrapped in white leather, and enables its user to use both eyes to focus on an object while keeping the binoculars steady on the stand. These binoculars are capable of reaching up to 12x magnification and can be focused using a knurled focusing ring in the center of the binoculars. The wooden tripod stand polished to a smooth white gloss finish. Each of the legs comes with solid chrome fittings and a screw release to let you adjust the height. 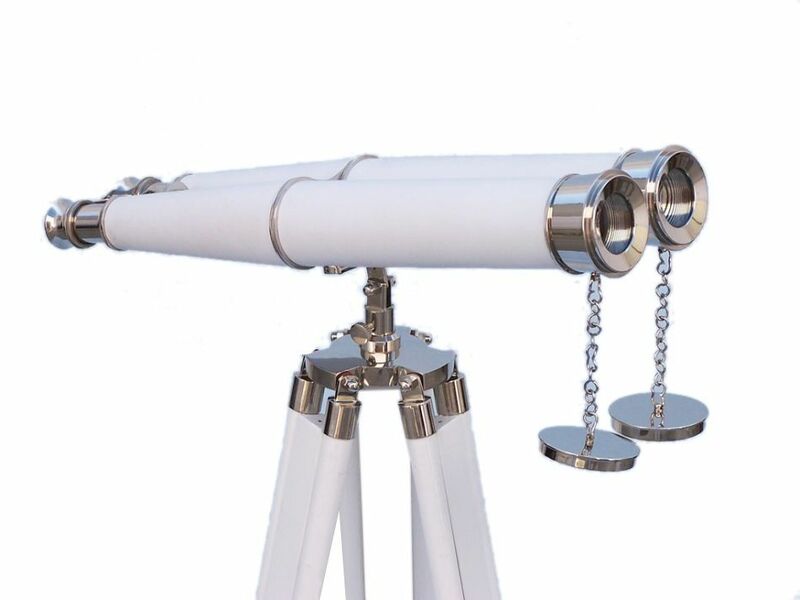 A solid chrome chain holds the three stands together so the binoculars hold their position.